I have more than 18 years of trading experience. 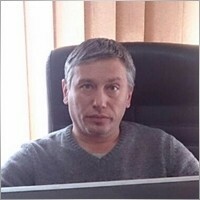 Except of forex trading also I worked with vanil options. When I traded in divergences I had got 60-80% profit each year. Constantly I'm searching a new currency pairs that will be useful for my method of trading. I put currency pairs to demo-account only after their showing of good results (4-6 pips of expected value) in tester. I started to use pair in real account only after, at least, three months of successful trading (at least 3-4 pips of expected value). In the same time I don't stop to monitor the price movement of well-recommended currency pairs. Based on the results I change algorithm, time of trading and if it's necessary I change position size or even I can take of the pair from active trade. In that moment I successfully drive a trade in six accounts. I can't wait to start working with you. Please don't hesitate to address to me I always answer for all questions! Среднесрочная торговля от важных уровней. EUR/USD continues in the range that it has been in over the past few weeks. The markets continue to trade in a steady manner and this was reflected in the way that the euro had been tied to a small range for much of the day yesterday. The pair continues to trade below the 1.24 region and below the highs of its range and it remains to be seen how long this is going to continue. The euro has been locked in this range for the past many weeks and it looks set to continue in this manner for the short term. None of the economic data or geopolitical issues seem to be affecting this pair or its range at this point of time. We also saw the retail sales data from the US yesterday which came in better than expected. But again, that did not have much of an impact on the dollar which once again leads us to believe that we are going to be in this range for quite some time now. It is indeed a difficult time for the long term traders who have been struggling to come to terms with the ranging and the slow trading but they have to live with it in the hope that there would be a breakout and it would be large pretty soon. Looking ahead to the rest of the day, we do not have any major economic news or data from the Eurozone or the US and hence can safely expect the ranging and consolidation to continue. The pair did not make much of a move as it spent the whole of the last 24 hours in a tight range on either side of 1.23. There is strong support for the pair in the 1.2250 region and that is likely to hold up against any further losses for the short term. But all that could change when the NFP data releases tomorrow. The euro, by itself, has been quite strong all this while and it has been aided by the strength in the incoming data from the Eurozone. It is the dollar that has been rocked by the incoming data and more by the geopolitical developments with each passing day bringing in new reports and news which are making the market headlines. After the threat of a global trade war, the US now seems to be backtracking a bit and this has been rocking the markets this way and that since the beginning of the week. Trump certainly has a knack of bringing in volatility into the markets. 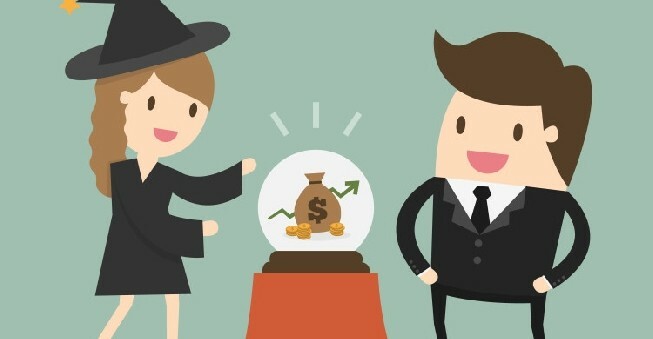 Looking ahead to the rest of the day, we do not have any major economic news from the US or the Eurozone and hence it is quite likely that the consolidation and the ranging would continue unless some of the option expiries and their holders decide to rock the markets at any point of time. EUR/USD: Euro flirts with $1.2300 on further USD strength ahead of the Non-Farm Payrolls. The EUR/USD is losing a few more pips, trading just under $1.2300 as the US Dollar gains some ground ahead of the highly-anticipated Non-Farm Payrolls. Earlier, the Euro suffered from poor industrial output figures and the echoes from Drghi's downplaying of the ECB's hawkish tilt. Draghi dealt a blow and sent the pair below the uptrend support line it worked so hard to capture. On the other hand, the EUR/USD still trades above the 50-day SMA which comes out at $1.2270, the low seen earlier this week. The RSI is almost perfectly balanced at 50 while Momentum is marginally negative. Looking down, $1.2270 is the immediate support line, followed by $1.2205, the mid-February low and $1.2155, the low point in early March. On the upside, $1.2360 reasserts itself as a line of resistance, followed by $1.2450, the high point on Thursday, and $1.2555, the three-year high. EUR/USD slips back to 1.2480. The pair retreats to the 1.2480/70 band. USD stays bid on US yields. US payrolls seen at 180K. The shared currency keeps the correction lower intact at the end of the week, with EUR/USD now grinding lower towards the 1.2480/70 band, or session lows. Following three consecutive sessions with gains, spot is now losing some momentum despite recording fresh daily highs beyond 1.2500 the figure during the Asian trading hours. The renewed buying interest around the greenback remains propped up by the solid performance of the key US 10-year yields, which are navigating levels last seen in April 2014 in the 2.80% neighbourhood. Later in the NA session, US non-farm payrolls are set to rule the near term sentiment in the global markets. Expectations see the US economy to have added 180K jobs in January and the jobless rate to stay at 4.1% in the same period. At the moment, the pair is losing 0.22% at 1.2487 facing the immediate support at 1.2399 (10-day sma) followed by 1.2336 (low Jan.30) and finally 1.2251 (21-day sma). On the other hand, a breakout of 1.2522 (high Feb.2) would target 1.2537 (2018 high Jan.25) en route to 1.2571 (high Dec.16 2014). EUR/USD failing at 21-hourly SMA, where next? EUR/USD capped at 21-hourly SMA at 1.2244. Retreating from a fresh multi-year high above 1.23, capped at the 21-hourly SMA and weighed by mixed comments from ECB policymakers, EUR/USD trades on the soft side, currently, trading at 1.2229, down -0.31% on the day, having posted a daily high at 1.2324 and low at 1.2196. While markets await next week's ECB presser, we have heard from Constancio (ECB VP), Villeroy (France) and Nowotny (Austria) who have all expressed concern about euro strength and its impact on inflation. Analysts at Scotiabank explained that the EUR’s daily candle chart is throwing off of a growing number of worrisome signals"
"Firstly, we highlight Tuesday’s ‘hanging man’ doji, typically observed at the end of an uptrend. Secondly, we note the potential completion of a bearish ‘evening star’ reversal formation, set to be confirmed on a close below the midpoint of Monday’s bullish candle (1.2230). And third, we note the potential for a bearish outside range. 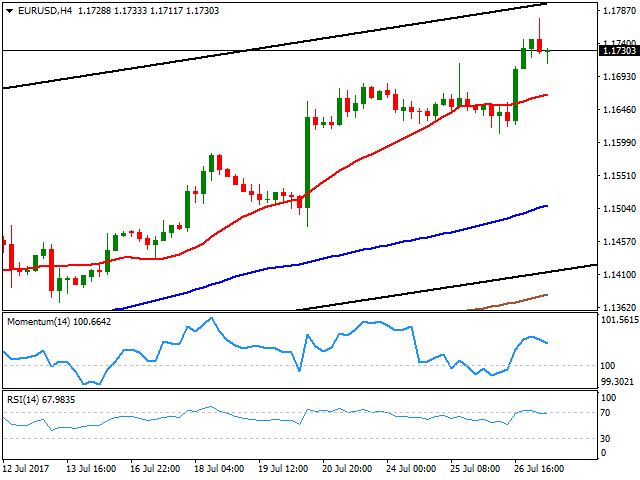 EUR’s momentum signals are bearish and in overbought territory. Near-term support appears limited between 1.2200 and 1.2120," the analysts added. EUR/USD targets 1.2300 as USD selling remains unabated. The EUR/USD pair caught a fresh bid tone and broke its consolidative phase to the upside, now printing fresh three-year tops near 1.2280 region amid aggressive selling seen in the US dollar across the board. The US dollar took a hit further against its major rival on a breach of January 2015 lows, triggering stops and falling as low as 90.12, as markets believe that the monetary policy divergence that we saw between the Fed and other global central banks is likely to narrow amid rising expectations of increased global interest rates this year. The EUR bulls continue to ride higher on the German coalition breakthrough news as well as on the hawkish ECB minutes release, with investors now gearing up for a test of the 1.23 handle, following the release of better-than-expected Eurozone trade balance data. Recent surveys have pointed to buoyant consumer and business sentiment, which suggests that the prospect of tighter ECB policy is not actively weighing on domestic animal spirits. This week’s minutes for the Dec ECB policy meeting (Thu) may show signs of hawkish dissent – with some officials favouring an explicit end to the ECB’s QE bond-buying programme later this year. Yet, with EUR/USD holding ground above 1.20, we think this story may already be priced in – and the guessing game over the ECB’s next move serves a useful purpose in keeping EUR upside contained for now. While we see no major catalyst for a move below 1.20, a positioning adjustment could fuel a correction down towards 1.1910/30. Our preferred tact would be to buy this EUR/USD dip. • USD struggles to build on yesterday’s recovery move. • A goodish pickup in US bond yields capping additional gains. • Focus shifts to US ADP report for fresh trading impetus. The EUR/USD pair extended its steady recovery move from the key 1.2000 psychological mark but lacked any strong follow-through momentum. Overnight US Dollar recovery move, supported by upbeat ISM manufacturing PMI and perceived hawkish FOMC meeting minutes, now seemed losing steam and remained supportive of the pair's modest uptick on Thursday. However, a goodish pickup in the US Treasury bond yields, which although failed to revive the USD demand, was seen keeping a lid on any meaningful up-move for the pair. Adding to this, the prevailing bullish sentiment in equity markets was also seen denting the Euro's funding currency status and further collaborated towards capping gains. On the economic data front, the release of final Euro-zone services PMI prints, expected to match flash estimates, are likely to pass unnoticed and traders are likely to take cues from the release of the ADP report on the US private sector employment. 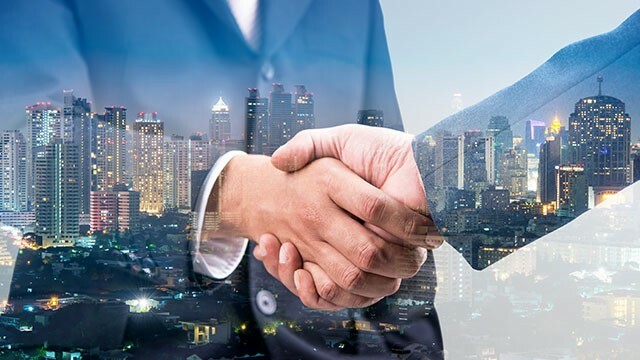 The EUR/USD pair remained better bid in Asia on the final trading day of the week, having found fresh buyers just ahead of 1.17 handle, as investors look to take cues from the USD dynamics and persisting risk trends amid a data-light trading calendar ahead. The spot witnessed a volatile session on Thursday, with good two-way businesses experienced, after the prices fell sharply during Europe on large option expiries casting a shadow on the Euro, while ECB minutes also added to the sell-off in the major. The ECB minutes showed that the members of the Council were worried over the exchange rate appreciation and felt that accommodation was needed in either direction. However, in the last US session, the EUR/USD pair regained footing and jumped to 1.1754 levels, following the release of downbeat US industrial figures and amid renewed US political jitters. In the day ahead, it remains to be seen if the major manages to regain 1.1750 barrier amid ongoing US dollar weakness and risk-off market profile, while the second-liner economic releases in the German PPI and current account are expected to have little impact on the Euro. From the US, the prelim consumer sentiment could offer some respite to the USD bulls ahead of the Fed official Kaplan’s speech. The EUR/USD pair closed flat for a second consecutive day around 1.1750, as US PPI data provided a reality check on where US inflation and therefore the Fed stand these days. US July headline PPI came in below expected, falling 0.1% monthly basis, and up by 1.9% when compared to a year earlier. The EUR/USD pair dropped to a low of 1.1704 yesterday before ending the day with moderate gains at 1.1772 on the back of a dismal US PPI reading. Despite the risk-off tone and the improvement in the US-German 10-yr yield spread, the support offered by the trend line sloping upwards from the June 23 low and July 13 low has remained intact. Moreover, the previous two daily candles carry a long lower shadow/tails, which highlights dip demand. The spot remains flat lined around 1.1770. A break above 1.18 [10-DMA] would expose 1.1824 [Aug 8 high], above which a major hurdle is seen directly at 1.1910 [recent high]. On the downside, an end of the day close below 1.1708 [trend line support] would indicate that the rally from the June 20 low of 1.1119 has ended. The spot could then test support at 1.1613 [July 26 low] and 1.1583 [July18 high]. A Bloomberg survey shows the core CPI, which excludes food and energy, probably rose 0.2% in July. If the actual reading does match estimate, it would mark an end of a four-month streak of below forecast readings. It is crystal clear by now that the fate of the USD is directly tied to inflation readings. A better-than-expected core CPI could yield a break below the rising trend line support seen today at 1.1708. The US Dollar came under some renewed selling pressure on Thursday following the release of dismal US PPI print, helping the EUR/USD pair to recover from the 1.1700 neighborhood. The greenback extended overnight slide amid intensifying war of words between the US and N. Korea. Markets now braced for a closely watched consumer inflation figures, due for release later during the NA session. The most important event risk for the U.S. dollar this week is Friday's inflation report but consumer prices alone won't be enough to save the Dollar. FOMC voter Dudley joined the chorus of U.S. policymakers expressing concern about low inflation. He said it is going to take some time for inflation to rise to 2% as the weaker dollar affects import prices. He believes that year over year price measures will be depressed for a while and that the economy may be a bit more sluggish on the margin. He also felt that sluggish productivity could dampen wage growth despite job gains. As one of the main drivers of Fed policy, Dudley's cautious views confirm that the central bank is in no rush to raise interest rates especially after this morning's producer price report. По словам аналитиков BBH, на прошлой неделе стерлинг поднялся на новые максимумы после референдума, но технические показатели не особенно сильны, в частности, медленный стохастик не подтвердил рост стерлинга. «Стерлинг чередовался неделями роста и снижения с начала мая. На прошлой неделе фунт стерлингов вырос примерно на 0.8% по отношению к доллару, поэтому на следующей неделе он должен упасть, чтобы сохранить целостность модели. Реакция рынка на встречу MPC и данные по рабочим местам в США может определить, продолжится ли этот шаблон чередования. Хотя поддержка расположена примерно на $1.2980, может быть более важным, как мы подозреваем, в этом качестве предыдущая цель-сопротивление и уровень восстановления около $1.3055, если этот уровень будет прорван. 50% -ный уровень коррекции падения после референдума составляет $1.3430 (согласно данным Bloomberg). Между тем, евро консолидируется чуть ниже GBP0.9000. Рынок предпримет еще одну попытку, но прорыв может оказаться ложным», - сообщили они. 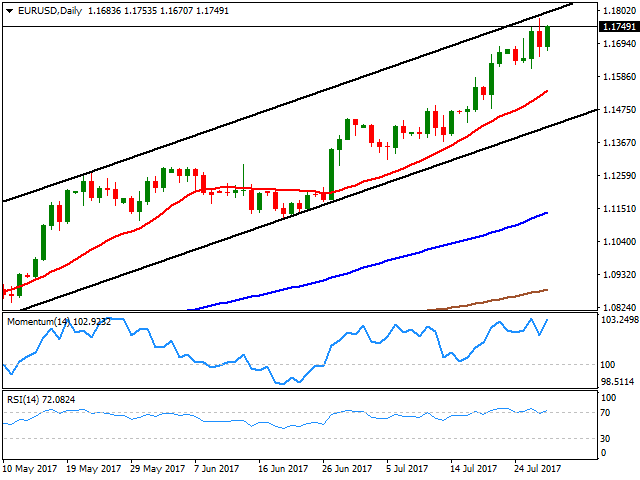 EUR/USD´s rally extended for a third consecutive week, with the pair settling at fresh 2017 highs and at levels last seen in January 2015 above 1.1700 and not far from 1.1776, the high reached following the latest Fed's monetary policy decision. The US central bank maintained the status quo and barely changed the wording of its previous statement, indicating that they will start reducing its $4.5B balance sheet "relatively soon," after unanimously decided to keep rates on hold. On inflation, the Fed sounded a bit more concerned than previously, persistently low, despite strength in the jobs' market. Market now foresees some clearer clues on normalization of the balance sheet coming next September, but doubts the Central Bank will be able to provide a third rate hike this year, unless inflation picks up. Beyond the Fed, data coming from US was mixed, with Durable Goods Orders picking up in June, but the core reading showing a tepid advance, and a solid Q2 GDP headline that anyway indicated softening inflationary pressures. Bottom line, inflation is still an issue in the US and a drag for the Fed. Adding to the picture was the repeal and reject Obamacare bill battle, as Trump got a small victory, by finally getting enough to support to get it into the Congress, but the optimism was quickly offset by news showing that the US Senate rejected the project, in late vote on Thursday's nigh. A scaled-down version of the bill was voted down by three Republican senators, resulting in a 51-49 vote against it. In Europe, data released at the beginning of the week showed that growth remained strong at the beginning of the third quarter, with preliminary July Markit PMIs missing expectations, although with the indexes still near six-year. German inflation released on Friday surprised to the upside, rising by 0.4% in July according to preliminary estimates, doubling market's expectations of 0.2%, and when compared to a month earlier. Annual inflation was up by 1.7%, with the core reading resulting a 1.5%, in line with June's figure, but above market's expectations of 1.4%. The numbers added pressure on the ECB over reducing stimulus, which will likely back further EUR's gains. The risk is that increasing inflationary pressures and further gains in the common currency will start weighing on local growth. The EU will release its inflation figures next Monday, and Q2 preliminary GDP on Tuesday, when the US will unveil its PCE inflation data. From a technical point of view, the bullish bias remains firm in place, as despite being overbought, there are no signs that the upward momentum is exhausted, or about to ease. In the daily chart, the price is nearing the top of a daily ascendant channel coming from mid May, in the 1.1810/20 region for the upcoming week, whilst technical indicators resumed their advances after a modest correction of overbought conditions. Moving averages in the mentioned time frame, maintain their strong upward slopes far below the current level. In the weekly chart, the pair faces a major resistance at 1.1800, the 200 SMA, while the RSI indicator keeps heading north around 75, but the Momentum turned south, still within overbought territory. Beyond the mentioned 1.1820 region, speculative interest will likely try to push it towards the 1.2000 threshold, a major psychological level before deciding to take some profits out of the table. To the downside, 1.1710 comes as an immediate support, followed by 1.1612, the weekly low and also 2016 high. A downward acceleration below this last could indicate a steeper downward correction towards the critical 1.1460 area. Market has continued to gave up on the greenback according to the latest FXStreet Forecast Poll, with the American currency seen shedding ground next week against all of its major rivals. In the longer run, however, it seems that speculative interest believes the greenback is near a top, as the number of dollar bulls in the three month view has increased strongly in most major pairs. For the EUR/USD pair market goes for a bullish extension next week, although in the longer run the dollar could recover some ground, with the 3-month target now seen at 1.1409 from previous 1.1537. Bears in longer perspective jumped to 86% from 48% in the previous week. The EUR/USD pair reached 1.1776, an over two-year high during the Asian session, and as a consequence of Fed's monetary policy announcement, which bring no news. The US Federal Reserve failed to clarify when it would start reducing its $4.5B balance sheet, sounding a bit more concerned on softer inflation, triggering a dollar's sell-off. The advance could have lost upward momentum, but the case for a dollar steeper recovery is for now out of the cards. The intraday slide is seen as corrective, moreover as the pair is currently recovering after nearing the 1.1700 figure. In the data front, the US will release its June Durable Goods Orders and Trade Balance, alongside with weekly unemployment claims. Should the figures miss expectations, dollar's decline will most likely resume. Technically, the 4 hours chart shows that indicators are retreating from overbought readings, but also that the RSI is losing its downward strength around 68, while the price remains well above a bullish 20 SMA. Additionally, the price is near the top of the daily ascendant channel coming from mid-may, today around 1.1800/10, the probable bullish target in the case of an extension beyond the mentioned daily high. The immediate support comes at 1.1710, where the pair topped previously and met buying interest early in the session, followed by 1.1665. The American dollar retains the soft tone across the board, with the EUR/USD pair inching higher at the beginning of the day, adding a couple of pips to its recent yearly high, now being 1.1683. Nevertheless, there was little follow-through, with majors confined to tight ranges ahead of London's opening. The European session brought the July Markit preliminary services and composite PMIs, which came below expected and previous, sending the pair down to 1.1629. The figures indicate easing growing momentum in the EU for a second consecutive month, but the numbers also indicate that the rate of growth is just slightly below the recent six-year high. For the EU, the Markit manufacturing PMI came in at 56.8, down from previous 57.4, whilst the services index remained flat at 55.4, resulting in a Composite PMI of 55.8, from June's final reading of 56.3. 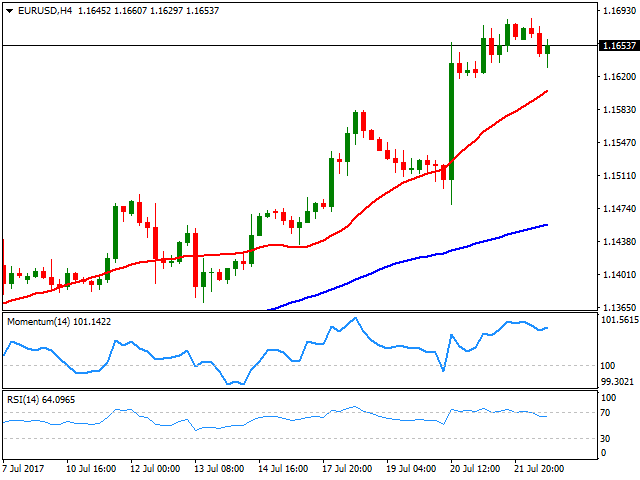 Ahead of the release of the US flash July PMIs, the EUR/USD pair managed to bounce from the mentioned low, holding on to the 1.1650 region, still at its highest in two-years, and with no aims of turning south according to technical readings in the 4 hours chart, technical indicators have resumed their advances near overbought levels after a modest downward correction, whilst the price remains above a firmly bullish 20 SMA, this last at 1.1600. Beyond the mentioned high, the pair has its next intraday resistance at 1.1713, 2015 high, with a break above it exposing the 1.1740/50 price zone. A downward corrective movement could come on a downward acceleration through 1.1620, towards 1.1580, July 18th high. «Весьма вероятно, что доллар действительно потерял почву под ногами против евро и иены на ближайшие месяцы на фоне неопределенности в отношении реформы налоговой системы в США», - сказал Дэвид Ву, глава международного отдела анализа ставок, валют, финансовой стратегии и экономики в Bank of America Corp., в телефонной конференции. «Потенциал укрепления доллара США ограничен, пока не будет большей ясность в отношении налоговой реформы, которая начнет рассматриваться в конце сентября или даже октябре», - говорит Ву в презентации. «Быки по доллару должны оставаться в стороне до этих пор», - считает эксперт.